Barys Astana held a number of regular season matches in the Continental Hockey League championship on the New Year Eve and after the New Year. On Dec.25, the Christmas day, Barys played a magnificent match in Magnitogorsk with the local Mettalurg, the current holder of the Gagarin Cup, KHL’s top title. Main and additional time did not produce the winner, with a tie 6-6, so it all had to be decided in the shootout round, where the hosts got the most luck. Later, Barys lost a road game 1-3 to a Chernyshev division neighbor Avangard Omsk. Back at home, on the penultimate day of the last year, the capital’s players slightly cheered up their fans, presenting a New Year gift, 4-2 victory over Traktor Chelyabinsk. Barys won the first two matches of 2015. First, they overpowered their main rivals in the division this year, Salavat Yulaev of Ufa, in a 3-1 road game, and later confidently prevailed over Avtomobilist Yekaterinburg with a score 4-1 in Astana. The day before yesterday, Barys once more played Metallurg Magnitogorsk, this time in Astana. After incendiary 7-6 match in Magnitogorsk, this time the rivals conducted a more pragmatic game. 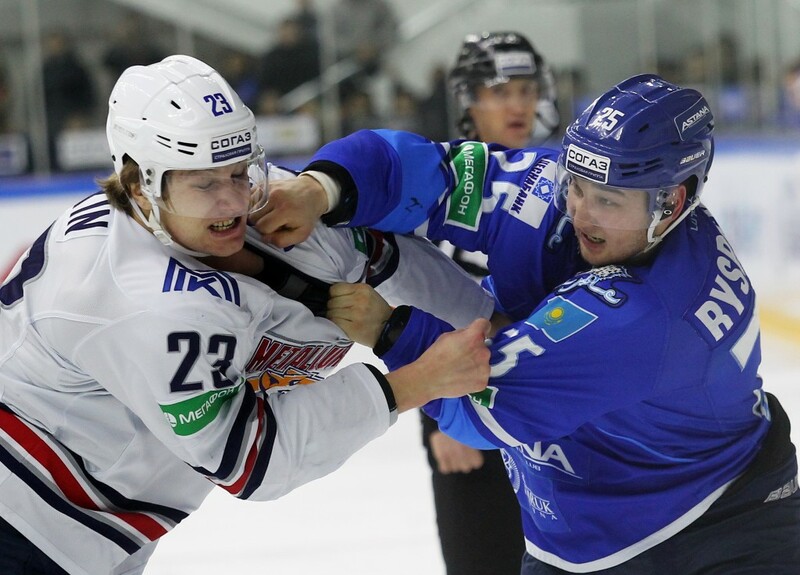 Especially Metallurg, which in the first period worked strictly on defense and dangerous counterattacks. And if visitors’ goaltender Vasily Koshechkin did not make mistakes unlike at the previous meeting, his counterpart, Pavel Poluektov “broke up” and finished his winning streak of three games. 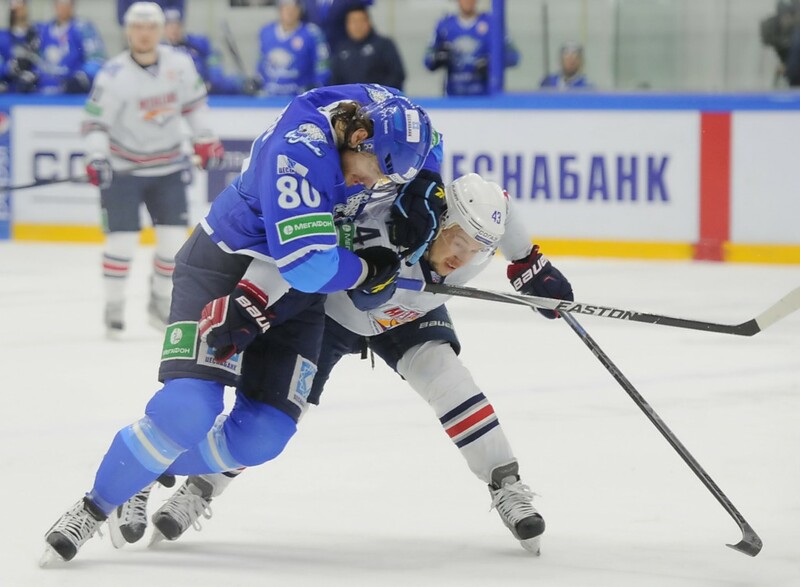 Barys were welcoming hosts, by the 13th minute, allowing guests to make three goals. Barys head coach, Andrei Nazarov replaced Poluektov, giving a chance to a nominally fifth goalkeeper in the Kazakh team Dmitry Malgin (Jan Laco, Vitaliy Eremeyev and Alexey Ivanov were injured). In the first period, only 19-year-old Ryspaev brought joy to Barys fans. Newbie boldly challenged Timkin and put an experienced enforcer on the ice with the first strike. However, we should also pay tribute to former Nazarov’s pupil, “Knight” Timkin stood up quickly and during the second part of the battle was already on an equal footing. Yielding 0-3 by55th minutes, Barys, despite the epidemic of injuries (eight players were in the hospital), almost saved the match. Two goals by Nigel Dawes and Roman Starchenko in 21 seconds before the match ended, so at the last minute Koshechkin’s gate had one heap after another. Crowded stadium commended the spirit of Barys and both teams left the ice court with applause. After 46 matches in the KHL championship “Barys” ranks 6th with 66pointsin the “East” Conference, being one of the most highest-scoring teams in the league. Forward Nigel Dawes tops the list of the best snipers of the league along with a striker from the Finnish roster Yokerit. Both players scored 28 goals. Dawes will take part in the upcoming Jan.25 All-Star Game in Sochi, and his last goal was the 100th anniversary in his unfinished 4-year career in the KHL. Prior to the All-Star Game Barys will have a road game with Avangard Omsk and a match at home with Salavat Yulaev and HC Siberia from Novosibirsk.